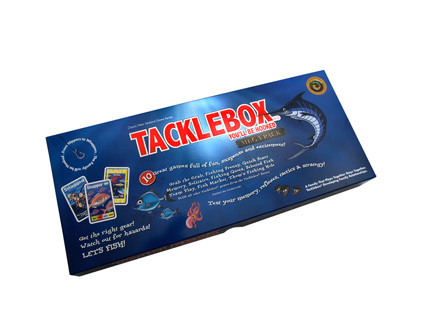 Even if you’ve never been fishing in your life, you’ll be hooked on the Tacklebox range of fun family games! With multiple ways to play, increasing levels of complexity, and guaranteed fun for everyone, play a speedy version if you have limited time or take on a more lengthy challenge with the strategic multi-player games. Tacklebox Mega includes an incredible 10 family fun games in this ultimate entertainment pack. Start with Tacklebox Speed for novices and as your skills increase you’ll be ready to take on Tacklebox Fish Market, an extremely active trading game, and Thom’s Fishing Hole®, a fast-paced game for the ultra competitive! Tacklebox Speed is the perfect introduction to the Tacklebox range for younger players. It is a fast paced, reflex based game excellent for both the birthday party and family markets. Kids will love challenging their slower moving parents! 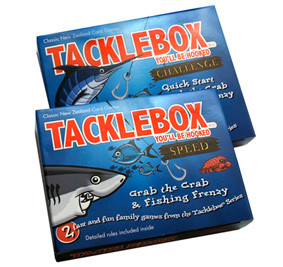 Tacklebox Challenge is great for travellers, family holidays and school camps. This set of 5 games is attractively packaged in a 2 deck card pack and includes 3 games that can be played solo, plus the two Tacklebox Speed games. Compact packaging makes it ideal for travellers and tourists. Enjoy some fun family times together for ages 7 to 107! If you would like to order any of the Tacklebox Range direct, please click on the icon. For bulk pricing options, please contact us with details of your request.